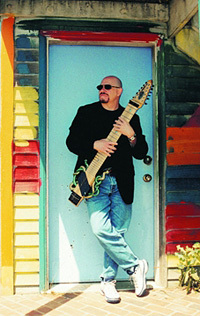 "Jazz is the sound of suprise, and Steve Adelson's The Answer's Inside keeps the unexpected going with the lyrically swinging Chapman Stick, adding a new dimension to listening." Jazz guitar, at times, can be homogenized and conservative. Contradictory to it's own idiom of improvisation, many presentations have become routine. What used to be adventurous is now standard. Art and music must move forward and challenge previous boundaries. In improvisational performance, the jazz guitarist should always keep searching for that perfect solo. Melodies, harmonies, rhythms, textures and dynamics must take on their own life as a vehicle for the guitarist's self expression. Don't play what you know, play what you feel. 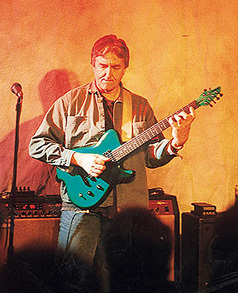 Allan Holdsworth certainly plays creative music, always pushing forward in search of the great sonic statement. From early recordings with Soft Machine, UK and Jean Luc Ponty, through eleven recordings as a leader, there's always been an uncompromising ideal to his vision. Allan's harmonies are sophisticated and complex with boundless textural considerations. The opening motif of "Metal Fatigue" is legendary. Melodies take unexpected turns with frequent intervallic jumps and unorthodox resolutions. His solos often are a cosmic storm of sound. Add to this the fact that Allan's style defines the term "Legato", with his combination of hammer-ons, pull-offs and picking techniques. And, although he's always attempting to improve his tone, it's never less than phenomenal. True to basic jazz ideals, Allan Holdsworth sings through his instrument and invents a personal landscape with every musical declaration. Allan was born in Bradford, England in 1946, and grew up in a musical environment, being taught music by his dad who was a very adept amateur pianist. Some early inspirations came from recordings by Ravel, Bartok, Stravinsky and DeBussy that Allan listened to as a young man. He was also exposed to Charlie Parker, Benny Goodman, Artie Shaw and Art Tatum through his dad's records. Allan Holdsworth: I actually never was interested in playing. I only wanted to listen to music. TCG: How then did guitar come into your life? AH: When I was about 15 or 16, I thought it might be interesting to try the horn, because I found myself listening to a lot of saxophone players. I was really drawn to the idea that you could shape the notes after they were sounded, as opposed to the guitar which was basically a percussive instrument. Saxophones were pretty expensive and we couldn't afford one, so I ended up with a guitar that I got from my uncle. I wasn't really that interested in this instrument. I wasn't particularly drawn to it. I soon took an interest in some local Skiffle music which sort of lit the torch. My father realized this and started helping me with my musical education. Interestingly, even though he was a pianist, he realized that playing scales and such with open strings on the guitar was counterproductive to playing in different keys. So I learned and still use lots of fingers to accomplish my musical ideas. TCG: Were you listening to any guitarists at that time? AH: Of course when I listened to Benny Goodman, I was exposed to his guitarist, Charlie Christian. I also loved Django Reinhardt, but there was something about the electric guitar that I was drawn to. So I tried to learn Charlie Christian solos. I absorbed them quite quickly. Then I would play two of his solos and then play one of my own. I couldn't really create, and realized this was not a good process for me. I needed a different direction. I soon purchased some records by John Coltrane and this changed my whole life. TCG: This was early Coltrane? AH: I just bought everything I could find that he was on. There was some with Miles, and most of it was from the "Atlantic" period. "Coltrane's Sound" is probably still my favorite recording of all time. When I heard people like Cannonball Adderly, I loved it but I could hear where it was coming from. I heard the history and evolution. But Coltrane sounded like he short-circuited or bypassed something and he got to the heart and truth of the music. He was playing over the same things but he wasn't doing it the same way. He didn't sound like anyone else. I thought this would be great, to play over chord changes, from something other than a bebop perspective. Basically this is what I've been trying to do from the beginning. Unfortunately, I never saw Coltrane perform. When he died, I cried for hours. I felt like I knew him. TCG: Were there any guitarists later on that you listened to? AH: I was extremely fond of Jimmy Raney. Of course there was Joe Pass, Tal Farlow and Barney Kessel. My dad bought lots of records to expose me to all this great music. Joe Pass' album Catch Me was mind boggling. But there was something about Jimmy Raney's sound that I loved. My favorite was a recording called Jimmy Raney In Three Attitudes which I lost during my move from England. I'm still trying to find the recording. He played a tune called "So In Love" and his solo is absolutely amazing. TCG: And some current guitarists? AH: I love Jim Hall's ideas and Wes Montgomery, especially his playing on a memorable tune called "Missile Blues." Of course, I personally know many guitarists, so I hear their music regularly. I always loved players who had their own identity, like John McGlaughlin, John Scofield, Scott Henderson and Pat Metheny. TCG: On your "orchestral" rubato type pieces are they pre-arranged or more improvisational? AH: Usually they're completely improvised. It then goes into a piece of music that's not improvised. TCG: Are you thinking melodically or harmonically? AH: I try to think about the whole thing. I use multiple delays on two Intelliflex units. They're very flexible machines. I just set up a few multiple long delays and I feed the sound into the processor with a volume pedal. The Synthaxe is what got me into this sound. TCG: Do you still have the Synthaxe? AH: I have two, but I use them sparingly. I can't play a regular guitar synth. The Synthaxe is not like a guitar. The notes are in the same places, but he feel is totally different. I could just forget I was supposed to be playing a guitar. I used to do clinics for Synthaxe and audience members would ask if I could make it sound like a Strat. It was pretty funny. They would want to play blues licks on it. It was quite hilarious. I never looked at it in that way. Quite the opposite. TCG: Tell us about your guitar evolution. AH: I started out with a regular steel string flat top at a young age. Then I got a Hofner. I think it was called a "President." Later I put a pickup on it. My father's friend built me my first amplifier. I used to love going to his place and watch him solder and such. This got me started in my interest in electronics. When someone lent me a Stratocaster, that was it. I couldn't believe it. It sounded like the Shadows, or Hank Marvin who was a huge hero to me. I bought a Strat and used it enthusiastically for about six months till I tried a Gibson SG. It changed me again. I sold my Strat and played SGs for about a decade. Later, I did experiment with Strats again but with humbucker replacement pickups. I liked that sound. In 1972, I recorded with a trio called Tempest using an ES-335. I later used the SG with Tony Williams' Lifetime Band. TCG: When did synthesizers enter the picture? AH: I tried the early Roland synth and loved the idea of the sounds, but it didn't really work for me. Tom Mulhern at Guitar Player magazine recommended the Synthaxe and that was where that relationship started. Also guitar-wise, I played Charvels for a while, and later discovered the Steinberger. That was it. I just thought it was amazing. It was real hard to switch back to any other guitar. I became friendly with Ned Steinberger. He would send me the guitars without any frets, and then I would send them to a luthier by the name of Bill DeLap and he would flatten the fingerboard, and take out the relief. I like the neck to be absolutely straight. We would put Jim Dunlop 6000 fret wire in it. I had quite a few of these. Also, Bill built me a few baritone guitars. He made me a regular length wooden Steinberger and basically I've been playing that till I hooked up with Carvin for this new custom guitar. I play about 80% of the time now on the Carvin and 20% on the Steinberger. It's still nice to switch back and forth. I love headless guitars. I think the new Carvin is an excellent guitar. TCG: I must ask you about your involvement with the Chapman Stick. AH: Emmett (Chapman) built me some custom Sticks that didn't have bass strings. There were two sets of strings, one tuned in 4ths and the other set in 5ths. It was like two guitars on one neck. He also loaned me a 3/4 size Stick that I wish I still had. I still own a regular size Stick with no bass strings. I like the instrument because of the string length. When yo do the tapping thing in the guitar the sound seems puny because the string is so short. I don't really play the Stick much anymore or acoustic guitar for that matter, after the Synthaxe entered the scene. TCG: When you play chordally, obviously we're not talking standard II-V-I progressions. Are you following your ear or possibly that Ravel and DeBussy influence? AH: It's just what I hear. If I write a piece of music, I try to get it harmonically settled. I don't really think about where it's going. I let it go where the music sounds like it wants to go. TCG: Must guitarists play out of visual shapes. Do you see the guitar as this type of instrument or is it just a tool for your vision? AH: I think I see all instruments as just tools. I didn't see this in the beginning, but I do now. For example, if John Coltrane had played another instrument he still would have been John Coltrane. If John McGlaughlin had played trumpet he'd still be amazing. it comes from somewhere else. Most people are lucky and find the right instrument for them right away. But for me guitar was definitely not love at first sight. I grew to love it. If I had played horn, I would have really missed playing chords. There are still things I don't like about guitar. For example, I really don't like to use distortion to get sustain. I don't love it but it's a necessary evil. I'm always trying to find another way to get sustain without sounding distorted. Also that big jazz guitar sound never appealed to me. I like what other people do with it though. I think George Benson is amazing. TCG: You studied scales differently then most guitarists. Could you explain your thought processes? AH: To me, it's a really logical system. I recognize and see certain scales. I don't think about what the root is. I just see a permutation of intervals. When I look at the neck the notes just light up where those scales would be. I hear a chord or a color. The harmony is one color and you can get two or three things that come along on top of it, that match it. I like playing things that some say would be a diatonically incorrect note. But it's really not, depending on how it's played. It's really appealing to me to weave in and out of these colors. I love the way that sounds. I also like to see the symmetries. For example, if we consider a C Major scale, with D as the center (D dorian) it's symmetrical in both directions. TCG: Do you have a way to communicate these ideas to your band mates? AH: I just play it. Someone at a seminar asked my bassist what it was like to play with unschooled musicians. The bassist lashed back and said "We use the language that we're speaking (music) to translate the information." TCG: Do you play differently with your various trios? AH: Sometimes we choose personnel because of chemistry and often it's just logistics. The new CD has Dave Carpenter on acoustic bass and Gary Novack on drums. TCG: The previous CD None Too Soon was slightly more traditional. You had quite a few cover tunes. AH: I try to be myself in any environment. It was keyboardist Gordon Beck's idea to play recognizable tunes. He thought it might make it easier for listeners to jump from this sort of CD to some of my other recordings. The new CD Sixteen Men Of Tain has a definite jazz feel. So again it's my music in a slightly different environment. It's all original music. I think it actually worked out better than "None Too Soon." TCG: Explain Gnarly Geezer, your new record label. AH: Steve Solomon and Tom Voli are two guys who were big fans of my music. Steve just approached me about starting this new label and that's where we're at now. We'll be trying some other marketing soon but right now it's only available over the internet (gnarlygeezer.com). TCG: We must at least bring up the topic of beer. AH: Do you have a few hours? I was always fond of English cask ale. When I first came to the States it was like being in the middle of a beer desert. I couldn't find decent beer. Cask ale is really soft like Guinness and all those carbonated beers just irritated my throat. I developed a system that would take a more ordinary beer that when pulled, would make the beer cascade like Guinness and it would have an unbelievably tight creamy head. It's just a hobby, but the systems are now installed in two local restaurant-pubs here in California. Allan speaks: I like lots of melody and I try to be harmonically creative with lines. But, I also like to use some dissonance, diatonically speaking, unusual and sometimes impolite notes. They are quite all right by me. I like to hear it from other players. It's like adding other colors, another dimension. I love that "what the hell was that" thing. However, some people/musicians hear an unusual note and think it's some kind of mistake. A shame, there is a colossal difference between a chosen note and a clam. But the difference is simple. Did you hear it? Do you want it? Did you mean it? If you did and it sounds good to you, it is good. Use it! Isn't that what it's all about? Finding the truth for one's self. Harmonic sensibility is a very personal individual thing. Most people/musicians hear things differently and what might please one, might not please another. One man's meat is another man's poison. Don't be afraid to dig, the most important people/musicians in my life always have. If you do decide to dig, don't always expect to come up with a clean face. It's o.k. The most important lessons to me, have been learned by trail and error. Unfortunately, mostly by the latter. Please do not misunderstand, I truly appreciate all the tings the world's greatest musicians have achieved and given to us; joy, wonder, beauty, spirit. All I'm trying to say is "try to find yourself," as they have.